Live CHP traffic reports and cameras for California. View up-to-the-minute California Highway Patrol logs. The February 2018 release optimises for iOS11 and the iPhone X. KEY FEATURES: Live data from California Highway Patrol (CHP): - 1,568 traffic cameras covering California State. 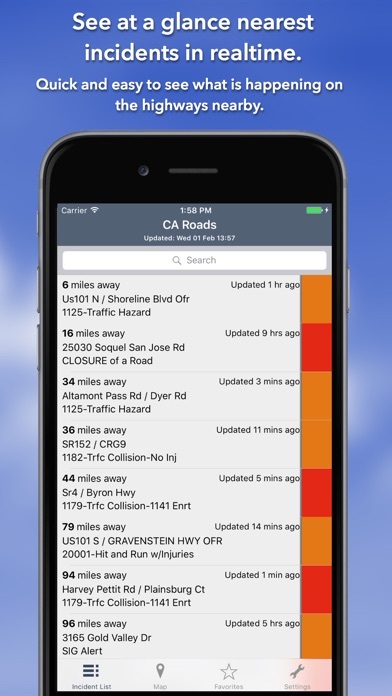 - Today screen widget to show at a glance the nearest current traffic incidents - Optimised for all iPhone and iPad models; fully tested on iOS9, iOS10 and iOS11. MAP VIEW - Shows current incidents and traffic cams. - Each incident is color coded as well as being represented by an icon showing the incident type. - Clicking on an incident displays more detail right there on the map. - The map view can also show live traffic camera images. LIST VIEW - Shows current incidents in order of distance from your current location (closest incidents are shown first). - Each incident is color-coded to indicate the severity of the delay. - You can quickly see the distance the incident is from you, the road name, the type of incident and when the incident log was updated. - The detail view shows the description and log of the incident together with a map showing the location. - Full search functionality, works across both the list and map views. 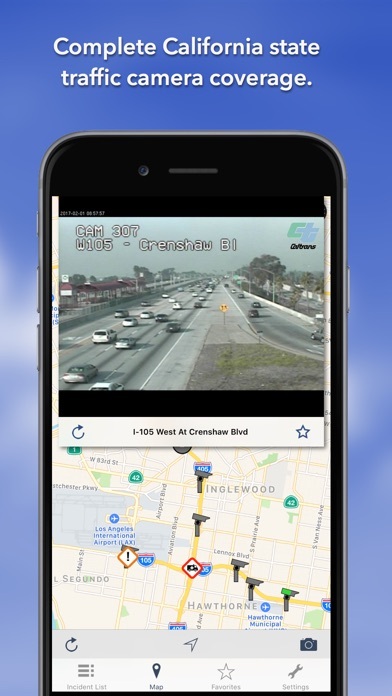 TRAFFIC CAMS - Toggle show/hide the cameras on the map. - Touch a camera icon on the map to view a live camera image. 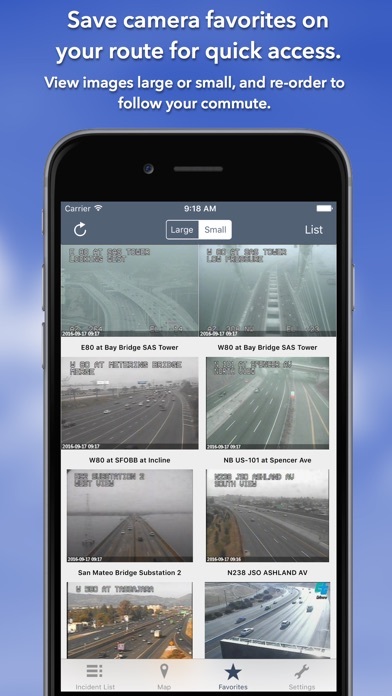 TRAFFIC CAM FAVORITES - Save your favorite cameras for quick access to see how clear/congested your usual routes are. 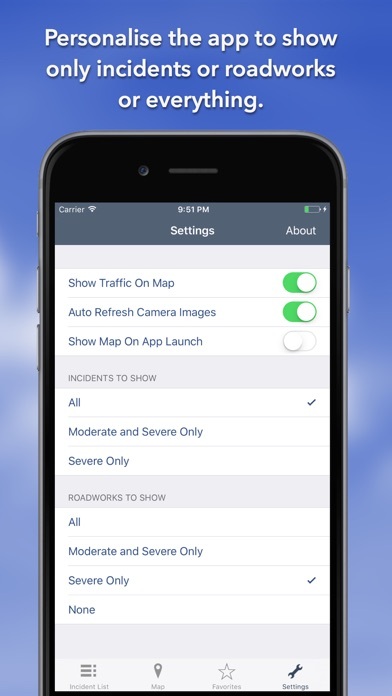 TODAY WIDGET - Shows at a glance the nearest current traffic incidents without launching the app. PERSONALISE - Toggle traffic information on the map. - Toggle auto refresh of camera images (will refresh every 10 seconds). - Toggle always show map on app launch. - Toggle roadworks on/off. - You can configure which incidents are displayed according to the severity of the delay caused. - Miles or KM setting. CHP GLOSSARY - Quick access to a full CHP glossary of terms to help you interpret traffic reports. CONTACT - Email me for feature requests/bug reports etc. I would love to hear from you! During recent snow storms, chain laws, and road closures everywhere. This app listed absolutely nothing the entire time. Too hard to follow. I miss the old app. It was much easier to follow. I would prefer to have it broken down into CHP area office sections than by miles. I loved the old app- so easy to use. Great search by city. I can only view by map or list of incidents by distance from me. Please bring back viewing by city! Easier to use than previous version. When we travel, this is a go-to app for the navigator, along with Apple Maps and Waze. I’m sorry but this app is nothing even close to the old CHP Traffic app that is no longer supported by iOS 11. The list view is extremely lame and impossible to read and the “FAVORITES” is nothing but mostly non working cam photos. 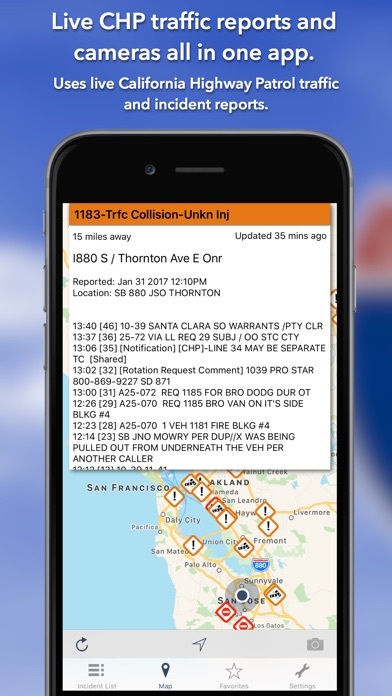 The other CHP app showed you a very comprehensive and complete list with info on each traffic incident out of each CHP dispatch office in your selected favorites. Also the map in this app seems to be just a link to google map traffic but within the app the traffic is VERY slow to load and update. Not current traffic info at all. Just go to google maps for more info than you will get with this hard to read app. The traffic incidents display as how many miles away from you. You select severe or moderate but I want to see just what’s on my home and the freeways I drive. I could care less what’s happening 5 miles away from me on some highway I never drive. Very lame and not even worth the $2 and I never complain about the price of an app. One star cause honestly I don’t care what’s going on south of me. Mostly because it doesn’t give you the option to pick a certain county. Not really friendly use for anything knowledgeable other then how to get around traffic and rubbernecking. I’m not even going to ask for a refund. Ain’t worth it. Great tool for checking traffic! I use this app at least twice a day - once for my commute to work, and again for the commute home. It’s a fantastic way of knowing if the roads are open or if there has been an accident. It’ll allows me to go a different route in case of a closure instead of having to turn around and drive 40 miles in the opposite direction to take a different route. 10/21/17 update - I was contacted by the Developer about the location of the CHP Glossary that helps decipher some of the more cryptic acronyms that are used. A little odd to get to: • Settings on the bottom right of the screen, then • About at the top right of the screen, then • CHP Glossary at the top right of the screen I guess that’s why I didn’t find it at first! Thank you to the Developer for the prompt response to my issue!